If Bethesda Softworks is successful in blocking the development of Fallout Online, Interplay says it will invalidate the sale of the Fallout IP and allow it to retake ownership of the franchise. Like most legal matters, the Fallout falling-out between Interplay and Bethesda is a complex one. Bethesda claims that Interplay violated the terms of the Fallout MMO licensing agreement and has thus forfeited the right to develop the game; Interplay says that Bethesda is being a jerk. But while the legal teams debate tiresome legal minutiae, Interplay President Eric Caen has ratcheted up the rhetoric a couple of notches by declaring that if push comes to shove, Interplay will just take its Fallout ball and go home. "We sold the Fallout IP to Bethesda in exchange for a certain amount of cash and the right to do the Fallout MMO," Caen told Eurogamer. "If they refuse to let us do the game, then the sale of the IP is terminated, and they will be allowed to do only one more Fallout, 5." "The original licensing deal was for three games and their DLC. So they already did Fallout 3, then Fallout: New Vegas, and they can only do one more Fallout, 5, if the sale of the IP is canceled by the court," he continued. "We will love if we have to do Fallout 6 and sequels. But we will see what happens in court. It can be this year or later... We have the back-up of our shareholders to fund this fight." Caen said Interplay is "ready to fight for years if necessary" to keep the Fallout MMO under its tent but added that as long as the litigation continues, it won't be able to show off much of it to gamers. "Anything we show will help Bethesda in their fight," he said. On the other side of the fence, Bethesda Vice President Pete Hines predictably declared the opposite to be true, claiming absolute domain over all things Fallout. "We own the rights to the MMO," he told VG247. "We own the rights to everything Fallout. The license is ours. Fallout belongs to us." 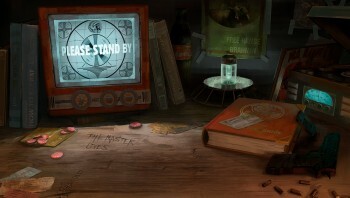 Fallout Online is tentatively targeted for release in 2012, although the ongoing legal dispute could derail that plan.